Semantic Travel Search. Comparative study of OTA’s search technology. How can semantic search improve the usability of online travel agencies? 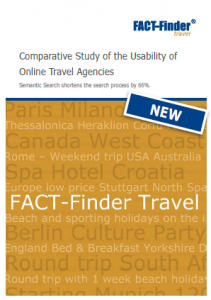 Our comparative study of the usability of online travel agencies was performed on 42 test persons in August 2011 (you can download the comparative study on the FACT-Finder Travel website). To study the behaviour when using online travel agencies, the test persons were first presented with a representation of five top-performing online travel agencies and next presented with the semantic travel search of FACT-Finder Travel. The results of the study were based on in-depth interviews as well as eye tracking performed on 70% of the test persons. Continue readingSemantic Travel Search. Comparative study of OTA’s search technology.